Will Pigs be Permitted in the Future? From this week’s Kol Emunim newsletter, page 2. Written by רב א ה ר from Beit Shemesh. This following translation along with further links to the online Hebrew sources from here. The false teachings of a so called Rabbi. And even the pig, Raza”l said that HKB”H will in the future return it and permit it, but because of its abundance of Tum’ah [spiritual uncleanliness] and filth, it has no rectification currently until the future when HKB”H will remove the spirit of Tum’ah from the earth. And scientists say that pigs cannot look up to heaven. This is because of its falling into the depths of the Kelipot and the strength of its judgement. This is why it is not mentioned in Perek Shira. 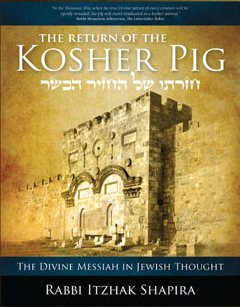 It is habitual in people’s mouths to say that the pig will become Kosher in the future, but really, the source for this is unknown since it is not found in the Midrashim of Haza”l known to us. Perhaps, it is a tradition that in the future, speedily in our days, at the time of conquest, it is destined to again become Kosher. The Torah will never be changed, and many Aharonim, like the Ikkarim (ibid), the Abravanel (ibid), the Responsa of the Radva”z (vol. 2, #828), and the Yefeh To’ar on Vayikra Rabba 13:3 have asked on this Midrash: how is it possible to be permitted in the future to eat pig meat when we know that one of the dogmas of faith is that the Torah will never change and there will never be another Torah from the Creator, may His name be blessed? HKB”H will, in the future, renew His creation with the 2 Simanim since right now, [a pig] only has split hooves, and in the future, it will chew its cud. And that which the verse testifies about it “והוא גרה לא יגר” is not future tense, as the Rada”k says, but rather a past tense verb. והוא גרה לא יגר means that the matter is conditional. As long as it doesn’t chew its cud [, it is not Kosher]. However, in the future, it will chew its cud and it will return to being permissible. And it is not that it will remain without chewing its cud and still be permissible for the Torah does not change. Definitely, HKB”H will not uproot one Mitzvah from all the Mitzvot, as the commentators and researchers have asked on the aforementioned Midrash. However, really, in the future, HKB”H will change the nature of the pig and remove its filth and its nature will be purified. So, if its nature is purified, it will hence chew its cud and will become permissible for us. And no Mitzvah is being uprooted from the Torah in this way since the Mitzvah remains forever – that a pig, who is haughty by nature, and thereby does not chew its cud, will forever remain forbidden. And a shorter version of this is in Torat Moshe on Parshat Shemini (on the verse זאת החיה). Is pig meat considered “something that has a future permissibility”? The Hata”m Sofer answers based on this foundation that the permissibility of the pig will be since its nature will change and will chew its cud, so granted those pigs that are still alive, their natures will change and will thereby become permissible. However, a pig that got mixed into a cooked dish or among other pieces of meat where its nature did not change before it died will be forbidden forever. Therefore, they cannot be called “something that has a future permissibility”. And the Or Yekarot on Shemini says the same on his own [YY- the Or Yekarot seems to say a totally different explanation to the Midrash. צ”ע]. Why will only the pig be permissible in the future? We really need to understand why the pig will change for the better over any other non-Kosher animal in that only it will become permissible to eat. The early sages already discussed this and explained this in various ways. We will copy the explanation of Maran Ha’Admo”r the author of the Hukei Hayim ZYA”A, who explained based on the holy Zohar (2, p. 41a) that the reason they took the Korban Pesah on the 10th of the month and all the other laws that are dependent on the holiday of Pesah is to show the Egyptians that their god is worthless – see there at length. Also mentioned there is that the prohibition of breaking the bones of the Korban Pesah is only so that the bones will roll in the garbage cans and thereby be degraded in the eyes of the Egyptians and they will see the degradation of their deities. We see that the main idea of the Korban Pesah is a means to nullify the Kelipa of Egypt. According to this, it’s possible to say that just like in the Redemption from Egypt, they brought the sheep and ate it in order to nullify their deity which was the Kelipa of sheep, and they nullified it by eating it, so too, in the future, when the redemption will be from the Edomite exile, and the Kelipa of Edom is a pig as is mentioned in Midrash (Vayikra Rabba 13:5), therefore, they will then eat the pig in order to nullify their Kelipa in this way, since by slaughtering it and eating it, it will become degraded and the Kelipa of Edom will be nullified speedily, Amen, may it be Hashem’s will. We will conclude with a nice anecdote from the [fourth] Belzer Rebbe ZTVK”L (brought down in the pamphlet “Sipurei Mofeit”), who was known to always advocate on behalf of Kelal Yisrael – and it was habitually said by the Admo”r [YY – I believe this refers to the Shomrei Emunim Rebbe] ZT”L that since the days of the Kedushat Levi from Berditchev, no one has advocated on behalf of Israel like him. Once, people spoke with him regarding secular people in Israel who were raising pigs in their homes, and he answered them that these people must believe and expect the coming of Mashiah Tzidkeinu when the pig will be permitted again to be eaten, and that is why they are raising them.